(this record also featured contributions by various members of The Fugs (Ed Sanders, Tuli Kupferberg, Steve Weber), alongside contributions by various “Factory” denizens (Andy Warhol, Gerard Malanga, Ingrid Superstar), not to mention, poet and novelist Ishmael Reed (reading from his novel), jazz saxophonist/instrumentalist, Marion Brown, and – the very first “noise” recordings of The Velvet Underground (featuring Angus MacLise)). and from Allen here and here. 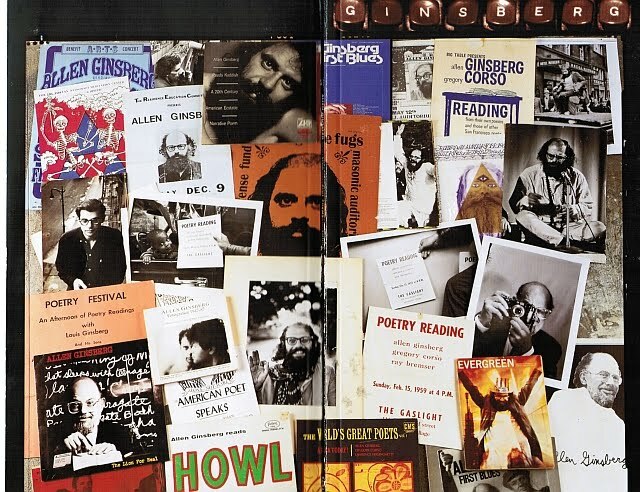 A veritable trove of archival material has just been put on line by the University of North Dakota’s Chester Fritz Library – six (now digitalized) tapes pertaining to the March 1974 5th Annual UND Writer’s Conference, featuring Allen Ginsberg, Peter Orlovsky, Gregory Corso, Gary Snyder, Michael McClure, Lawrence Ferlinghetti, and Kenneth Rexroth (and Miriam Patchen reading the poetry of her late husband, Kenneth Patchen). The technology back then was, it has to be said, pretty crude (now giving it, maybe, a kind of kitschy charm?). Minimal production values notwithstanding, the rebelliousness of the occasion (the Beats in North Dakota!) and the sheer verve and intelligence of the participants, comes barralling through. The other tapes are no less revelationary – four consecutive evenings of “Open Microphone” sessions. On the Tuesday, the entire company, sans Rexroth and Patchen, “discuss various topics”, “including censorship, the military-industrial complex, Limits to Growth by Donella H Meadows, environmental issues, farming, the history of City Lights Bookstore, Robert Bly, Robert Graves, among many other (thing)s” (to quote from the description in the archives). Wednesday, Miriam Patchen reads her husband’s work. “In addition Allen Ginsberg, Peter Orlovsky, Gary Snyder, Lawrence Ferlinghetti, Kenneth Rexroth and Michael McClure discuss energy conservation”. Thursday’s is a particularly good one, kick-started by an ever-irascible Gregory Corso,”Allen Ginsberg, Peter Orlovsky, Gregory Corso, Kenneth Rexroth and Lawrence Ferlinghetti discuss various topics including drug use for mind expansion, women poets, jazz and writing habits..”. Friday, they discuss “various topics”, “including subsistence farming, agri-business, environmental issues, the drug trade and its political impact, as well as strip-mining, particularly in reference to western North Dakota. In addition, Lawrence Ferlinghetti reads Pablo (Neruda?) in Spanish”. >New York, 1967, What Was Happening? [What’s Happening? (1967) from Django’s Ghost on Vimeo]. 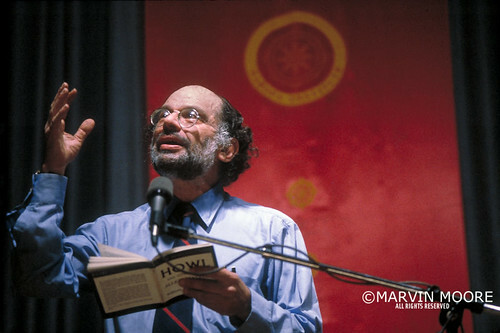 Marvin Moore’s extraordinary picture of an ecstatic Allen reading from Howl at Columbia University in 1981, on the occasion of the poem’s 25th anniversary, heads up our weekly round-up. Further images (a studio portrait (from 1985), two portraits of Allen in the street (from the same day) and Allen and Peter in Halifax, Nova Scotia (1992) can be accessed here. Check out his website for more indepth look at his work. Two new Allen biographies that we’re looking forward to – Well, Steve Finbow is just putting finishing touches on his (a critical biography, for Reaktion Books’ “Critical Lives” series). His thoughts on that can be found here. Meanwhile, Bob Rosenthal (Allen’s long-time secretary)’s first-hand account of life at the center of the Ginsberg vortex, Straight Around Allen, is, also. well on its way towards completion, so we hear. Bob Holman, recently on tour with her in Montreal, proposes what he calls “a Ginsberg turn-on”. It can, he explains,” take any form, so long as Allen is evoked (probably by reading his poetry), his energy acknowledged,(and) the continuance of his work engaged”. His own Bowery Poetry Club plans to inaugerate a “Ginsberg Turn On”, coming up soon, twenty minutes, each night, every Tuesday evening. Here’s a sad story about Harry Smith “turning in his grave” (from this week’s New York Post). And The Chelsea Hotel is similarly not what it was in days of yore. More on The Whole Shot, Rick Shober’s project on The Collected Interviews with Gregory Corso, that we mentioned last week, can be found here. And.. 54 years ago today Chester MacPhee of United States Customs Office in San Francisco seized 520 copies of the second printing of Howl and Other Poems on the grounds its contents were obscene. Videoheads, an artist’s video collective, now based in Amsterdam, made several video recordings of Allen over the years, in London, Amsterdam, and Paris. This is a snippet from his performance (with Steven Taylor and Peter Orlovsky) at the Pompidou Center in Paris in 1979. The spirited rendition of “Guru Blues” is introduced by, (unrelated) Allen, en francais, noting that the children of Ethel and Julius Rosenberg (Robert and Michael Meeropol) had written a book (We Are Your Sons: The Legacy of Ethel and Julius Rosenberg (1975)), about their experience growing up as the children of the famously executed pair. Dark Cold War secrets. The version of “Guru Blues” is followed by a reading of the poem “On Neal’s Ashes”. And here, by contrast, is the studio recording. Another Allen on Film – Ruth Du’s short, Six’55 (featuring Roger Massih as Allen) – “a historical interpretation of the first night Allen Ginsberg recited his famous “Howl” in the Six Gallery in San Francisco in 1955” – just won the prize for “best undergraduate cinematography” at NYU’s Fusion Film Festival. 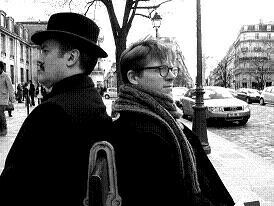 No, it’s not James Franco and Aaron Tveit, it’s not, clearly, Allen and Peter, it’s Peter Bulcock as The Poet (taking Allen’s place) and Aden Cardy-Brown as Guillaume Apollinaire (taking Peter’s place) in this hommage to Harold Chapman’s iconic photograph, “taken in the same place, on the same (Parisian) bench”, last year, during a gap in the filming of Nic Saunders’ upcoming short feature, At Apollinaire’s Grave (“based on the poetry of Allen Ginsberg”). Saunders’ 14167 Productions have already been responsible for an award-winning short, Curses and Sermons, based on a poem by fellow-Beat, Michael McClure. 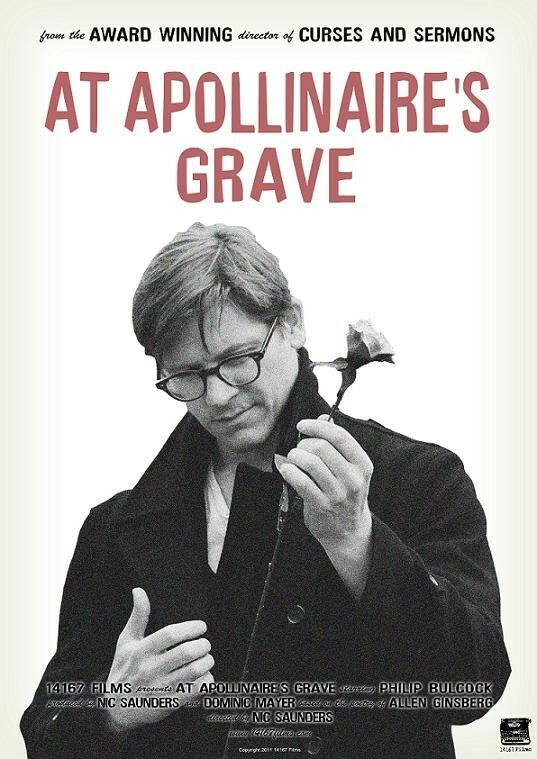 At Apollinaire’s Grave continues the series. A trailer for the for McClure one is here, the Ginsberg one, here .